CHALLENGE. 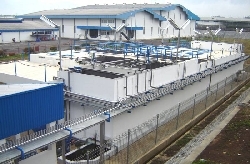 PT Beiersdorf Indonesia, a subsidiary of the German personal-care product manufacturer Beiersdorf AG, required a site for domestic gray-water and industrial-wastewater treatment for its Malang, East Java facility. SOLUTION. NWC conducted all aspects of design, construction, and operational training for the Malang facility. RESULT. The treatment plant was completed within schedule and budgetary agreements. Its combined treatment regime serves as model for industrial wastewater treatment for other companies in the region.